If I could offer you a third hand, would you be interested? Who wouldn’t? Almost as good, that’s texthook – the dashboard for your mobile life. iPhone, iTouch, Blackberry, Droid, HTC, Palm – most whatever you’re carrying – it’ll hold them. 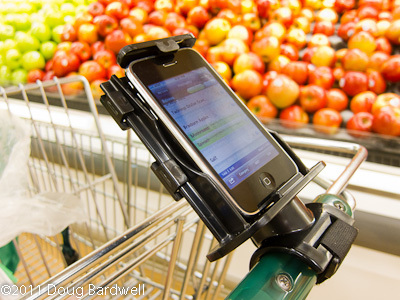 If I had a nickel for every time I saw someone pushing a stroller, riding a bike or pushing a grocery cart with one hand, and holding their phone in the other, I’d be a rich man. With all the things that a smartphone is capable of, it’s no wonder we never put it down. There are great grocery shopping apps on the iPhone, but the phone slides right through the child seat on a grocery cart. Solution = texthook. Smartphones now have awesome GPS apps but did you ever try holding one while biking through the park? Not safe (for you or your phone.) Solution = texthook. Taking the baby for a stroll in the mall? Mom’s always need both hands available for those unexpected whatever’s. Solution = texthook. On the treadmill at the gym? Want to watch a video on your iPod or iTouch? Solution = texthook. With a convenient Velcro strap, the texthook will fasten to whatever handlebar you come in contact with. It’s connected in less than 10 seconds and now you have both hands free. The tilt can be adjusted in most directions to make sure the screen is comfortably readable. Once you use it the first time, you’ll never leave home without it. Check out their website, where you can find a list of stocking retailers and a list of compatible phones.